Fall is about the best time to be outdoors in Texas. It was the same way when we were in Arizona. I don't remember a Thanksgiving that we didn't eat out on my grandmother's porch. If you are planning some outdoor parties during October and November, check out this cute idea for a tablecloth weight. Time some miniature gourds to strings! 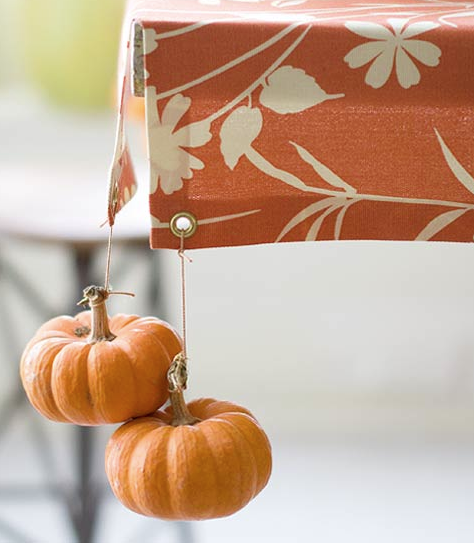 BHG put grommets through the tablecloth, but if you could easily gather the table cloth and tie it with twine, and then hang a pumpkin from each side of the string. Check out this idea and more great ideas for decorating with gourds HERE.